It’s impossible not to wake up excited about the day in Rio de Janeiro. There’s a reason they call this “A Cidade Maravilhosa” – the Marvelous City! After waking up, Jeff and I headed downstairs for our complimentary Brazilian breakfast. We had a tour pre-booked to explore the city this morning. Our guide, Luis, picked us up by microbus at 9 a.m. for our four-hour historical tour and walk of Rio. We first saw old Rio in the historical center. We visited the São Bento Monastery, Praca XV, Candelaria Church. 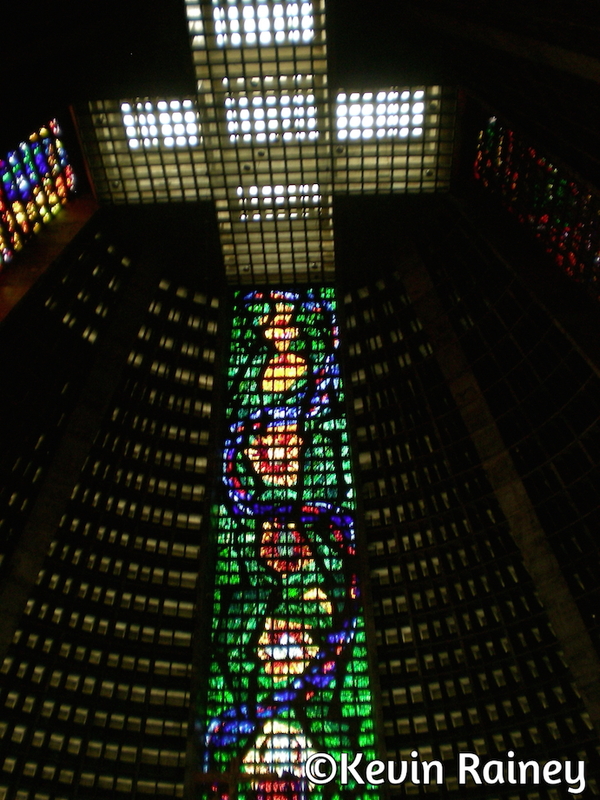 Afterwards, Luis drove us to the Catedral Metropolitana which was extremely colorful and contemporary looking inside. Interestingly, the bells were outside and separate from the cathedral. Then we saw the França-Brasil House, old Market Street and the Imperial Palace, before finishing at the famous delicatessen, Confeitaria Colombo. Luis showed us the choices of salty or sweet pastries. While we enjoyed the food, Luis asked us if he could help us arrange anything, even women. We explained that we weren’t looking for women, but Jeff said he was interesting in hang gliding. Luis called his friend Paolo, and put him on the phone with Jeff. Paolo put us down for Saturday. After eating our lunch, Luis took us upstairs via the oldest elevators in the country to see the parlor below. After enjoying the walk through Old Rio, Luis took us back to Ipanema. It was a great tour. After arriving back in Ipanema, the weather was getting cloudy. We decided to grab a quick lunch at McDonalds around the corner and hurry over to visit Corcovado mountain. We took the Metrobus system for the first time (the Metro Na Superficie) by buying a combi ticket (called an integraçao). 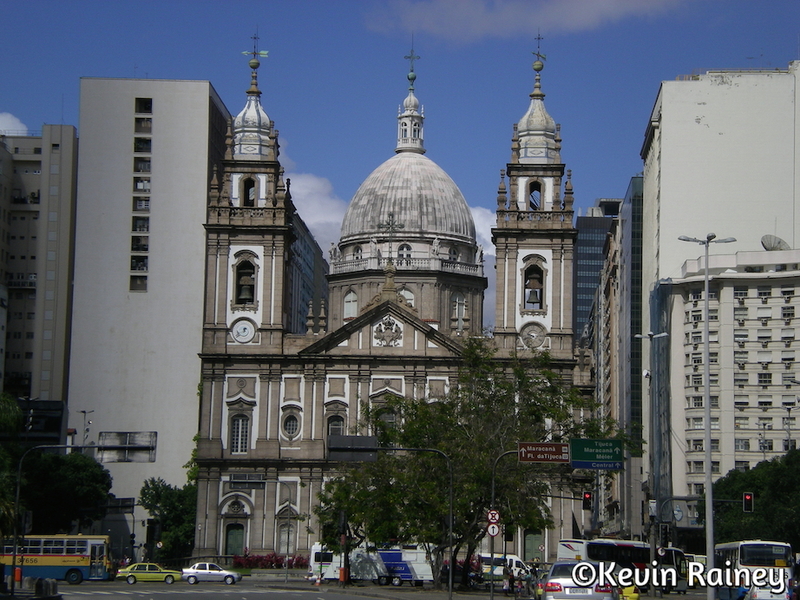 After we arrived at Metro line 2 in Siqueira Campos, we took the train to the Largo do Machado metro station. Then we took a bus to the Corcovado’s train station. We boarded the Corcovado train (trem do Corcovado), which would take us to the top of Corcovado Hill, 2,300 feet above the city. The trip cost about R$ 36 and took 20 minutes to the top. A comfortable train took us through the Tijuca National Park where we made a brief stop in the world’s only urban rain forest. Then we continued up to the summit to see one of the most famous landmarks in the world: Cristo Redentor or Christ the Redeemer. We chose to walk the 222 stairs instead of waiting on the elevator). The Christ is the largest Art Deco statue in the world standing 98 feet tall, which does not include its 26-foot pedestal. 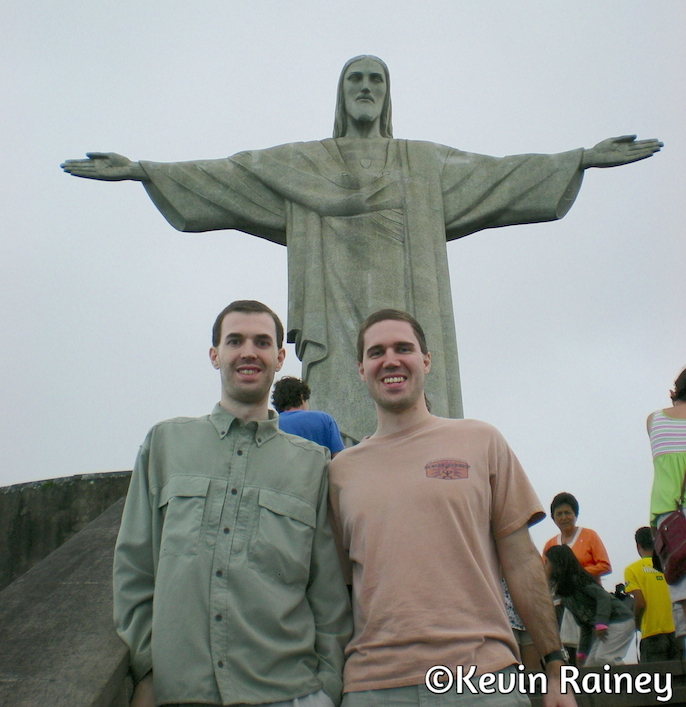 Jesus’ arms extend 92 feet and welcome everyone to Rio. The statue was constructed from 1922 to 1931 and is made of reinforced concrete and soapstone. We had to jockey for position on the steps to have our photos made with Jesus. Of course, everyone had to pose for an outstretched arms photo! Then we went in a small chapel located in the base of the statue. I never even knew the chapel existed before our visit! After admiring the statue, we were blown away by the view of the city below. We saw the Maracanã stadium, the largest stadium in the world, below us. 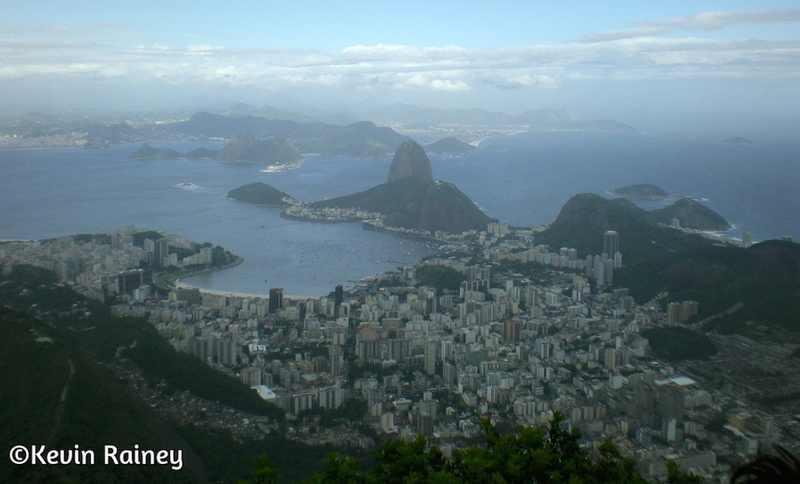 We could see Pão de Açúcar (Sugarloaf Mountain), the old town as well as the beaches of Leblon, Copacabana, and Ipanema. I don’t think there is a more beautiful city anywhere in the world. Even though it was cloudy and overcast, it was extraordinary to see how the green forest met the urban sprawl and the beautiful coastline below. We easily understood why Rio is called the Cidade Maravilhosa, or the Marvelous City. On the train back down, we went through a favela. We noticed a little trying to steal caps and sunglasses off peoples heads from outside the carriage as we descended. He almost the sunglasses from the guy sitting across from us! After taking the train back down, we went in a souvenir shop at the train station. I bought a Brazilian flag design towel, a Rio de Janeiro T-shirt and a small statue of Cristo Redentor. Jeff and I had worked up quite an appetite and were hungry for dinner. We were in the neighborhood of Laranjeiras and decided to go a highly recommended Brazilian steakhouse called the Gaucha Churrascaria for dinner. Much like our steak experiences in Argentina, a churrascaria was quite an overwhelming experience choosing our cuts from of meat from hundreds of choices on a diagram at our table. After ordering our first cuts, it just kept coming! Definitely some of the best beef I have ever tasted. We couldn’t stay late into the evening, but we heard the restaurant had a great live music scene with singing and dancing. After dinner, we took a taxi back to Ipanema. We went up to the rooftop pool for a view of Ipanema and Copacabana before going to bed. Another amazing day in the Cidade Maravilhosa!